How To Create a Blog - 11 Reasons To Start a Blog Today! In August of 2011, I found out about blogging and decided to learn how to create a blog of my own, so I created Making Sense of Cents. I didn't know a thing about blogging and I never planned to make a penny from it. But after learning how to create a blog, my life completely changed. I never realized it back then, but I'm so glad that I gave blogging a chance. Figuring out how to start a blog has definitely treated me right! Due to that, today I am going to talk about how blogging changed my life as well as the many reasons for why you may want to learn how to create a blog. After all, blogging has been one of the best things ever for me. Blogging changed my life and it allows me to earn thousands of dollars a month, all by doing something that I love. As you can tell from my business income reports, I now earn over $100,000 a month from my blogging-related services. I definitely never thought that I would leave my day job as a financial analyst to become a full-time blogger either. I found out about blogging one day when I was reading a magazine that featured a personal finance website in one of their articles. That website was super interesting as I knew that I didn’t want money to rule over my life anymore – I wanted to be in control of my financial situation and pay off my student loans. This is interesting and hilarious because before that summer, I had no idea what blogs were, that they could even make money, or anything along those lines. I did not create my blog with the intention of making money, rather I wanted to have a “journal” so that I could go back and track everything that I’ve done – I thought this would be a great way to stay motivated about my finances because I would be tracking them very closely. It was all just a hobby and an outlet, but I soon realized how much I loved blogging and realized that it was for me! In October of 2013, after a couple of years of blogging, I left my day job and became a full-time blogger, and I haven't looked back once. Learning how to create a blog has completely changed my life for the better, and it's something that I recommend everyone try if they are thinking about it. I now love what I do and look forward to working each day. I am able to help others improve their financial situation. It will allow us to retire early. Both me and my husband were able to leave our day jobs. It paid off my student loans. There are many reasons to start a blog, and I have found it to be well worth it. Here are 11 reasons to learn how to create a blog. Blogging is a lot of fun. Before I started blogging, I never gave it a single thought. Like I said, I didn't even know that they existed, let alone that it would be fun work. Now that I’ve been blogging for over 5 years, I can’t imagine not blogging. I enjoy helping others improve their financial situation, reading blog posts from others, finding new people to talk to, working on my blog, and writing especially. I love waking up each morning to work, and I no longer dread work like I did when I had my day job. Blogging is both challenging and rewarding, as there is always something new to learn and you can reach many people through your blog. You can help others if you learn how to create a blog. Even though I didn't realize it would happen when I first started my blog, as it has grown over the years I have helped many people – including myself! Your blog can definitely help others that you probably would have never reached without it. You may help them by showing them a new idea, help them improve their finances, create recipes, manage their life better, and more. For example: My blog posts help and motivate others to improve their financial situation as well as their lives overall. I have received many emails over the years from readers who I have helped, and it makes it all worthwhile. Helping readers is the best! It's affordable to create your own blog. 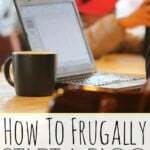 Blogging is a very affordable hobby, side hustle, or business to start. If you are interested in taking the steps to learn how to create a blog, I have a tutorial that will help you create a blog of your own for cheap, starting at only $2.95 per month for blog hosting (this low price is only through my link). In addition to the low pricing, you will receive a free website domain (a $15 value) through my Bluehost link if you purchase at least 12 months of blog hosting. This means that you may be able to start your blog for less than $50 a year. I started my blog for super cheap – cheap blog hosting, I designed my blog myself (even though I had no experience ever doing something like that), and more. I did pretty much everything myself so that I could save money, while it was a learning experience, it was well worth it. I’ve made a lot of good friends through my blog – both other bloggers and readers. These have grown into great friendships that I probably would have never made otherwise. Being able to connect and learn from others is a big positive of blogging. With blogging, you can be your own boss, and that’s a huge positive of blogging. You can decide what type of business you'll run, your schedule, your goals, and more. Blogging can help you grow. Blogging has helped me grow over the years. I've learned to master my financial situation, my love for writing has grown (back in highschool, I never thought that I would be writing for a living! ), I've met many different people over the years, and more. You don't need previous experience to be successful. In order to become a blogger and create your own blog, you really don't need any previous experience. I'm proof of that because I didn't even know that blogs existed when I started Making Sense of Cents, and I definitely didn't know that bloggers could make money. I learned how to create a blog from the bottom up and have worked my way to where I am today. It's not always easy, but it's been rewarding! With blogging, you'll have a lot to learn, but that doesn't mean it's impossible. It's challenging, but in a good way! Blogging can allow you to travel and/or work from home. Another great benefit of creating a blog is that you can work from wherever you want. Because of blogging, I was able to sell my house in 2015 and have been traveling full-time ever since. It's great knowing that I can work wherever I want. Plus, having no commute is really amazing! You can make a living blogging. If all of the positive above aren't great enough, you can actually earn a living by blogging. No, not every single person will become a successful blogger (it's NOT a get rich quick scheme), but I know many successful bloggers who started in a similar way as I did – blogging as a hobby and it just grew from there. 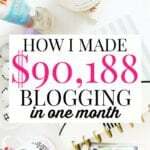 I earn around $100,000 a month through my blog, and there is still plenty of room for new bloggers to make money. You can earn money while you sleep. 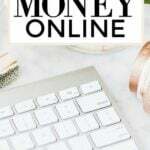 One of the things that I love about blogging is that the things you do now can help you to earn somewhat passive income, such as through affiliate marketing. With affiliate marketing, I can promote products that I already use and love, while earning a living from it even when sleeping. I recommend checking out my online course for bloggers, Making Sense of Affiliate Marketing. I earn around $50,000 a month through affiliate marketing, and I share my exact strategy and tips in this very informative online course. If you’re a blogger, then you NEED this course. Blogging is a great platform for freelancers. 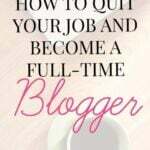 Not everyone wants to create a blog to become a full-time blogger. Blogging can also help you land freelance gigs, such as speaking, virtual assisting, staff writing positions, book deals, and more. By having a blog, people can find you easily, they can see a sample of your work, learn about you, and more. Without a blog, people may never find out about the services you offer. If you’ve been wanting to learn how to create a blog, I have created an email course for those who are interested, but haven’t made the leap yet. Best of all, this course is free! With this free email course, I will show you exactly how to create a blog, from the technical side (it’s easy – trust me!) 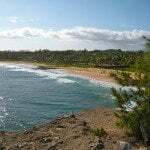 all the way to earning your first income and attracting followers. Each day for seven days, you will receive an email in your inbox that will help you from the beginning as you create a successful and profitable blog. Day 1: Reasons to start a blog. Day 2: How to determine what to blog about. Day 3: How to create your own blog. This lesson focuses on creating a blog with WordPress. My tutorial makes it very easy to start your blog. Day 4: How to make money blogging. Day 5: My tips for making passive income from blogging. Day 6: How to grow your traffic and followers. Day 7: Miscellaneous blogging tips that will help you reach success. Please sign up for my How To Start a Blog Free Course by clicking here or signing up below. Are you interested in learning how to create a blog? What other reasons to create a blog can you think of? Thanks for sharing these advantages of blogging. When you say “it’s NOT a get rich quick scheme”, it’s so true. A lot of person think like that but it’s really not a get rich quick without doing anything, you still need to work for that money. You need to do marketing, writing, publish … But someone who really want can achieve it. Yes, it’s a real business! So, today just while visiting Forbes I saw article about you and I hung on to your blog. I am very happy that I found this Great stuff. First of all Many wishes to you…!! U write so astonishingly well that I started reading your blog in reverse and would complete few of the previous pages. Yeah after reading your every post about creating blog now I really wish to start my own blog. though I visited the bluehost and eagerly wanted the membership but they need all the package money at once. can you suggest me the blogging websites which are free or fees can be paid on quarterly or half yearly basis..?? Many Thanks for such a great Job..
Will be a regular Reader now..
Also I will surely read all of your previous posts as soon as possible.. This is really great experience and all credit goes to you..!! I don’t recommend the free ones as it limits your ability to blog. Thanks to your easy posts on creating a blog, I was finally able to create one. I am having so much fun with my little blog. I love your tutorials and hopefully I can attend your affiliate course soon. I have heard such great things about it. Great list of points and advantages of creating a blog, Michelle! It’s a lot of fun ever since I made my own blog and it helps me keep track and dialog my experiences and knowledge for others to learn from it! Love this list, Michelle. I’ve only been blogging for 10 months, but I can’t imagine life without blogging now. The three best things that have happened for me so far is 1) I’m saving more (good ol’ accountability), 2) I’m learning every day and 3) I feel like I’m part of this amazing, supportive community (I’ve made some great friends!). Same here! Blogging is great. I started a blog with my friend at the beginning of 2017. I’m very happy I did; I’ve already seen a noticeable change in my thinking and writing. I’m able to make complex ideas simple much more easily. Do you recommend people do blog traffic and income reports for others to see? I know you do them, but for someone just starting out, is it a good idea to let others know? This is very relatable. I work in a high stress environment and the one of the things I look forward to is writing and blogging everyday. It’s been a very therapeutic and confidence booster that’s had a very positive affect on my life. Along the way I have made many friends in the blogging community in a similar boat. That you for sharing, I love to read how other bloggers came to be. The thing that I love about blogging is it just gives a great outlet for those of us who have weird things we do. Not everyone will like what we say, but if even a few people think I’m doing something to help them, it’s worth it (I love it when I get an email from someone telling me that I’m helping them!). The other great thing – it’s probably the lowest cost business you can start up. Yeah, it’s super hard, but there aren’t many businesses where you can get started for just a few bucks a month. And considering the fact that 3 billion people use the internet, you have a huge market that might be interested in what you have to say. Yes, exactly! It’s very affordable to start. Do you think you ever would have achieved your level of income and success with out blogging? I always wonder if successful people just found their niche or if they’d be a success in almost any industry. I like to think it’s their drive and not so much luck, but who knows! Ha, that’s an interesting question! It would have been a different level of success. I was on track to have a great position when I was a financial analyst. Congratulations Michelle on your feature on Forbes. I enjoy reading your success story over and over again. I have been blogging for two years and I absolutely love it. I am looking forward to start your course Making Sense of Affiliate Marketing soon. Even though I have had good luck with affiliate sales, I know that I could do much better. Thanks for sharing with us all your knowledge. Have a wonderful week! Love all of these points! I really, really love blogging – more than I thought I would. I had thought about it for years but never really knew what to write about – then got sucked into the world of personal finance! I’m so glad that I started a blog, although I do wish that I had started years ago! Blogging is one thing I thought I would regret because I’m an introvert and the thought of someone reading my content was ’embarrassing’. I created my blog as my own personal diary in a sense, and to maybe help the next person who clicked around. To my surprise I am loving it so much…even if I don’t exactly know what I’m doing all the time! Thank you so much for this! My husband and I have just started our debt journey this year and also a blog documenting it! Looking forward to the course! I agree with a lot of these points. I’ve been blogging for almost 4 years. My blog has helped me learn a lot of new skills. I’m glad I started it. You are actually the reason why I started blogging! I had signed up to your newsletter years ago to get finance tips. You will sometimes email me about blogging and how great it was. Last year I finally decided to create one and now I have been blogging for about 6 months and I absolutely love it!! It’s not easy but it is very rewarding when you slowly see how many people it’s helping. I enjoy blogging! It’s difficult to find time for it when you have a full-time job though. There’s a lot that goes into it! Congratulations on your success! I just started my blog last October. It’s been a blast building it and watching the number of views climb each month. As you said, the personal finance community is great and I really enjoy sharing my experiences with them. If I could share one piece of advice with myself 5 years ago, it would be to start a blog! Even though I’ve only been at it for four months, the experience thus far has been very rewarding! Thank you very much for your article! I recently started a blog and it really makes me happy working on it! Your income in phenomenal you rock! Again, thanks for your motivation! Hi Michelle, as always you’ve provided an excellent article. You’ve been one of the instrumental bloggers in helping me to get back on track with my blog. I feel the joy of writing/blogging again (haven’t felt it for a while) and I’m getting into a reasonable routine and seeing progress on many fronts. I’ll admit that I’ve been reticent to take it to the next level (I don’t know what’s holding me back, other than a commitment to the learning curve of email marketing and building a list). I think it’s the perfectionist in me that wants my blog perfect before I take it to the world! I’ll keep reading your advice and I know you’ll keep me moving in the right direction. Thanks Sandi. Have fun blogging! My blog has been the leading reason I have secured several writing clients. It’ll be nice once it starts earning consistent passive income, but, the active income earning potential is a great place to start. I’ve really been enjoying your recent posts–the one written for ProBlogger was amazing! I started my blog 7 years ago because I’ve always been a writer (for my full-time job) and a blog provided an outlet for me to write about topics I wanted to write about. I just can’t give it up. Now I have all these old posts that are kind of like an online diary. Plus I’ve spent so much time on my blog it would be devastating to just delete it. So I continue. 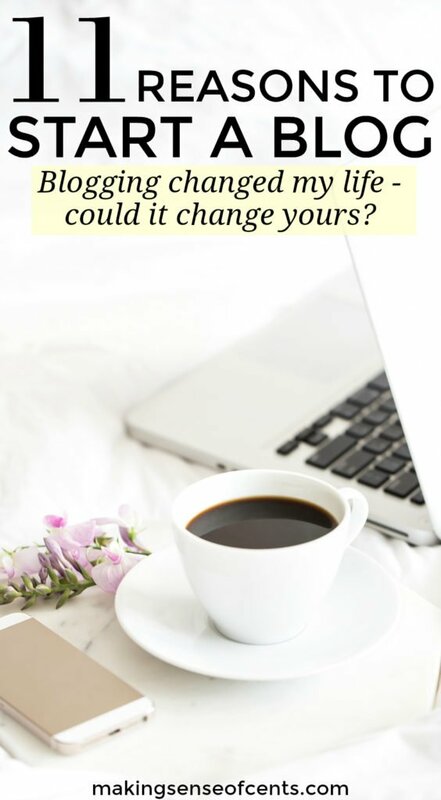 Blogging has changed my life, too. I absolutely love it – it’s one of the best decisions I’ve ever made! Not only is there the potential to make money (after MANY hours of hard work – definitely not a “get rich quick” thing) but there’s the opportunity to make friends, build connections, learn a ton of marketable skills, and just have fun! Love it! Blogging is such an outlet for me – it started by journaling, yet I began to love sharing my ideas with others! It’s fascinating the way others interpret the same ideas. It’s also transformed my writing, which is always a good thing. Hi Michelle, I couldn’t agree more. I personally love blogging and sharing my words with others. 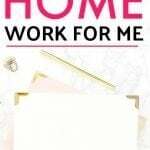 And, no doubt it’s one of the most lucrative ways of making money from home. I loved this article and am going to share it on my social channels. Thanks a ton! I like how you try to motivate people all the time, I’m sure more than one has decided to stop “thinking about it” and to finally start working on their own blog after reading your posts. Keep it up! I started a blog experiment a month or so ago, but so far I don’t think I’m even showing up in google. What do you recommend to find your first 100 readers? I have been blogging for a little over a year now and I’m so glad I’ve started! It’s been a really fun way to share my wisedom with the outside world and to hold myself accountable for my goals.